Ramadan is a time a of spiritual reflection, increased devotion and worship. It is a time when Muslims fast from dawn to sunset. 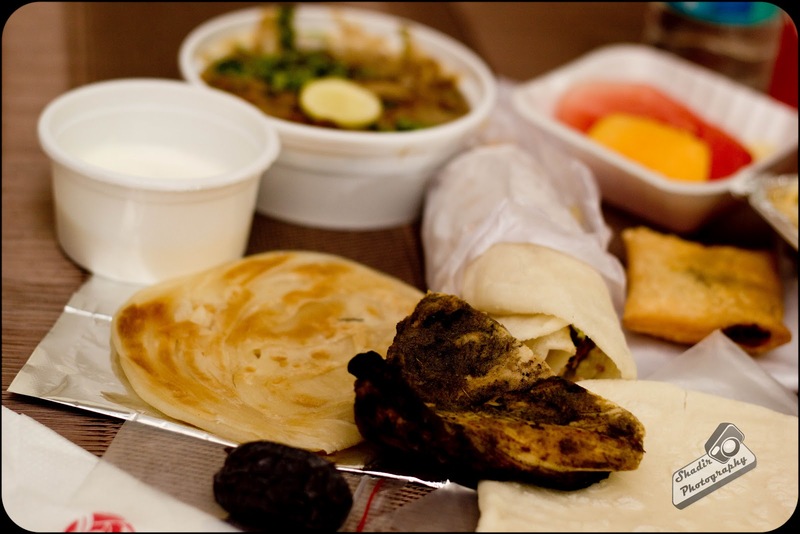 Most Muslims break their fast at home, with traditional food. For some others who are away from home or just want a change in food, the Muslim restaurants are there to take care of them. One evening, I decided on trying out some of the Iftar Specials which are available. I was returning home, and I happened to cross Zaitoon, Anna Nagar. I chanced to see a stall with Iftar Special Boxes, outside the restaurant. This made a light bulb glow in my head. I took a U-turn and headed to the restaurant to pick a couple of their Iftar Packs. I entered the restaurant and took a look at what they had to offer. 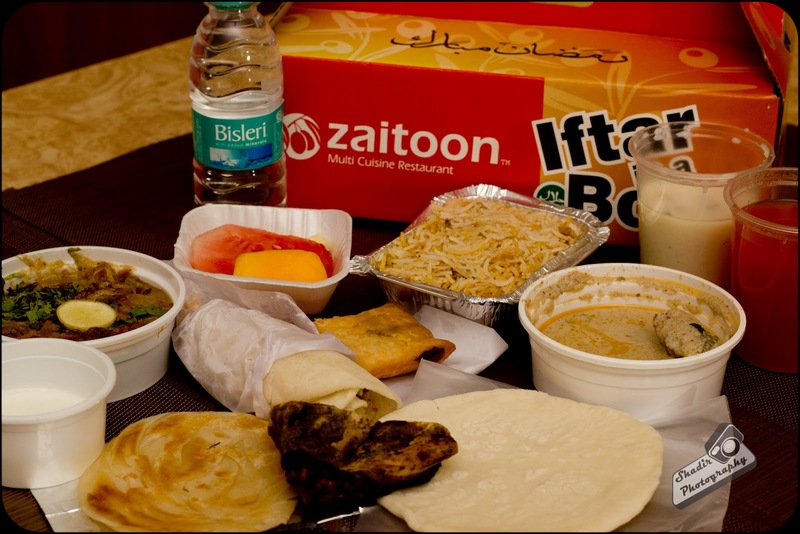 The Iftar box was quite big with a sample of all their best items packaged into one box. I picked two boxes and headed home to break my fast with my family. The entire box costs Rs 275/-. This box is a very good value for money. Also a box can feed two people. The Watermelon juice was just normal, while the Mutton Kheema Puff was outstanding. Very flavorful. Hope its on the regular menu so we can order and have them. The Chicken Shawarma was tasty, but nowhere compared to the regular shawarmas in size and the mayo filling. This was followed by me tasting the Haleem. The Haleem was lip smacking. I felt like having an another box. There was also a piece of BBQ Chicken which was tender and tasty which went well with the Khubus and Mayo. For the mains, the box contained Parotta and Chicken White Gravy. Though the parotta was good, it was let down by the chicken gravy, which was not that good. Sampling all this after breaking the fast was really difficult. But still I soldiered on. I tasted the Mutton Biryani. The biryani was light on spices similar to Hyderabadi biryani but with a Zaitoon twist to it. This was followed by me finishing off by gulping down the Sweet Drink ( Paayasum ). A very tasty meal, also a nice Iftar food! I had an another Iftar Box the following day as well. The box had a few changes to it, such as the drink had changed to Sweet Lemon Juice and the Parotta had changed to Iddiyapam ( Indian Noodles ) and Chicken White Gravy had become a Butter Chicken. Also the sweet Paayasum had become Milkmaid custard. The food in the box serves two. A very valuable box. Whether it is considered as a Iftar Box for the Muslims or as a Sampler by the others, it is up to you. 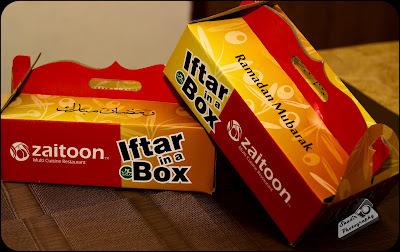 The boxes are available between 4:30pm and 6:30pm everyday during this Ramzan season. Zaitoon is located in Chintamani opposite to Naturals Spa. Tuscana by Willi, Chamiers Road - A Veg Diet! !